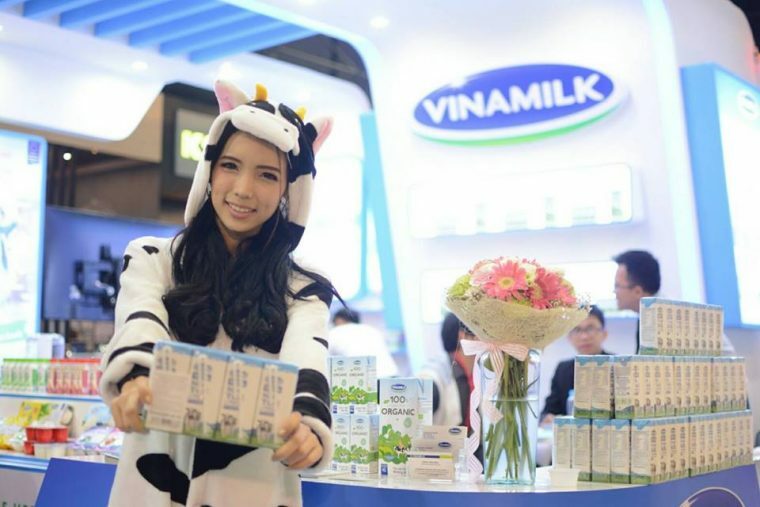 Vinamilk organic milk will enter Thailand in probably around September 2017, according to Topmost Enterprise Co., Ltd when contacted at Thaifex 2017. 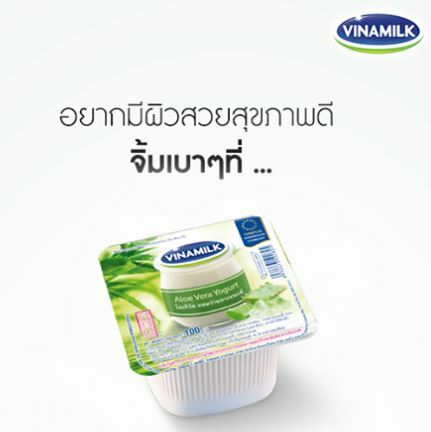 Topmost is the exclusive distributor of Vinamilk in Thailand. The organic milk will come from the EU-certified organic dairy farm in Da Lat, Vietnam. 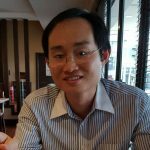 The price of the organic milk will likely to be more premium than the domestic non-organic UHT milk as seen in the example in Vietnam. 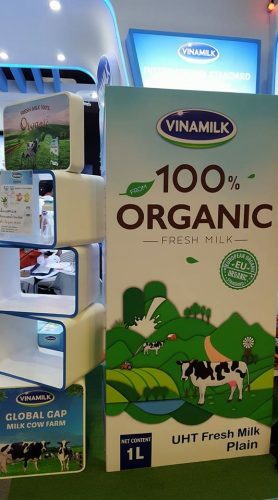 The debut in Thailand will make Vinamilk likely the only organic milk in the UHT format in the country. Click here for more information about the earlier launch of the organic UHT milk in Vietnam. 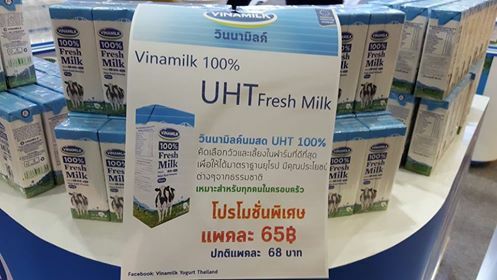 Topmost said it has introduced the 100% UHT fresh milk from Vinamilk in Thailand in May 2017. According to Topmost, there is room to grow in the 100% UHT fresh milk category as there are only a handful of players in the market. Vinamilk product is priced slightly higher than local producers as it imported. Vinamilk yoghurt entered Thailand in 2016 and is available at Tesco Lotus, Big C, Tops, Foodland, MaxValu, The Mall, Lawson 108 and Family Mart. The most popular variants are low sugar and aloe vera, said the company. This shows Thai consumers are opting for a healthier choice. The original Vinamilk yoghurt comes in a pack of four. There is no product description on the side of the cup. When displayed on the shelf, unless the four-pack format is tilted or wrapped with another set of packaging, the Vinamilk yoghurt will not be able to catch the attention of shoppers. The issue of not having the side wrapping is made worse when it comes to the display of individual cup. In Malaysia, Vinamilk was available for a short period of time. 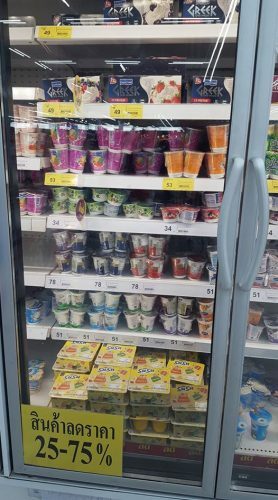 This was how the yoghurt was displayed on the shelf at Giant supermarket. 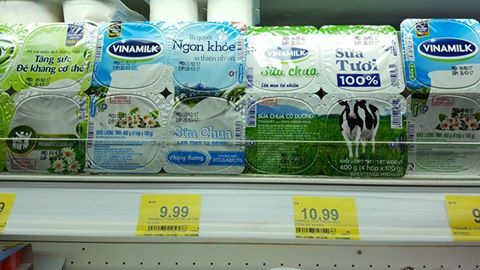 Below is an example of Vinamilk Susu yoghurt at Tesco Lotus Rama 1 outlet. The Susu yoghurt was given a packaging to ensure it is more visible to consumers. 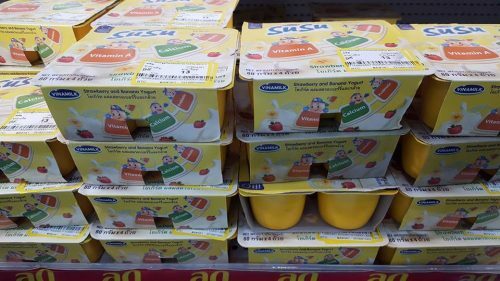 The Susu yoghurt at Tesco Lotus (image above) was given a markdown price of THB 13, down from THB 65 since they were close to the expiry date. Thai consumers are known for reading the label. Vinamilk yogurt does not come with nutritional information on the side unlike their Thai peers. This is something that needs to be addressed since Vinamilk yoghurt comes with a more premium pricing compared to domestic brands. Simple things like all-rounded packaging plays an important role in the success of a product and cannot be neglected. *All the Images were taken by the author.